Badou Ndiaye has taken no time at all to settle in at Stoke City following his arrival in January from Galatasaray. Since creating a goal for Xherdan Shaqiri with a wonderful right-footed cross on his debut at AFC Bournemouth last month, the Senegalese midfielder has been at the hub of everything Stoke do. Goals have been hard to come by all season for Stoke, so within Paul Lambert’s preferred 4-3-3 shape the manager needs midfielders who will drive forward and look to join in with the front men. Joe Allen, with two goals, and Darren Fletcher, with one, are the only members of Lambert’s central midfield to have registered Premier League goals this term. Lambert has opted for a first-choice combination of Fletcher, as the deepest of the trio, flanked by Allen and the energetic Ndiaye. Of those three it is the newest arrival who has displayed the most attacking initiative. Starting to the left of centre, many of Ndiaye’s touches have occurred in pockets of space just outside the penalty box. He loves to make runs into those areas as play builds up, and he nearly scored with shots from the edge of the area against Brighton & Hove Albion and Manchester City. The 27-year-old is keen to make late dashes into the box too. He also had a goalbound header well saved at Southampton. 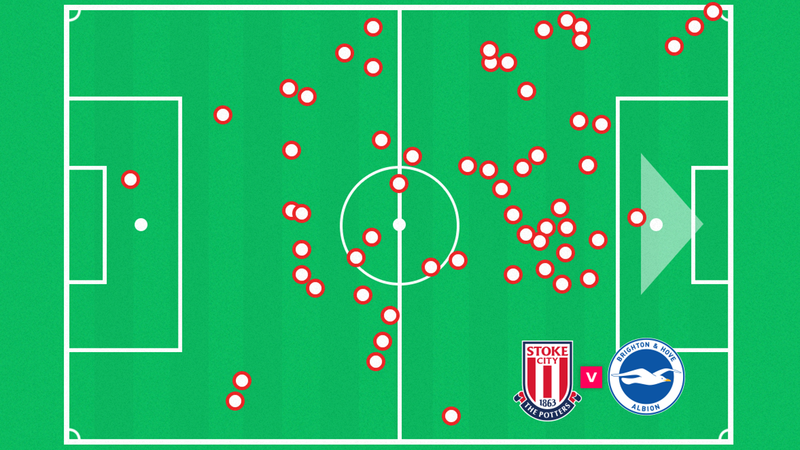 Ndiaye may not have scored yet but, since his debut, no player at Stoke has attempted more efforts on goal than him. Between now and the end of the season Stoke will spend long periods without the ball, meaning good defensive discipline is required. This is another reason why Ndiaye is such a suitable fit. He has a tigerish presence that suits his manager’s aims for a combative approach. No player has attempted, or won, more tackles than him over the last five matches for the Potters and he leads for recoveries, too. His desire to tackle also means he leads the way at Stoke for fouls, but his physicality has been a huge positive. Saturday’s home match with Everton will be only Ndiaye’s sixth appearance for Stoke, but he is already somebody Lambert can turn to for a strong performance.